Preheat oven to 180˚C. Sieve flour, Bake Aid, cornflour and icing sugar into bowl. Transfer to food processor and add almond meal and process dry ingredients for about 15 seconds. Chop butter into pieces and add to mixture with a few drops of almond essence and process until it resembles breadcrumbs. Tip the mixture back into the sieving bowl and knead briefly to form a smooth dough. Butter mini-muffin-pans. Form the dough into small balls and third fill muffin-pans, flattening the tops. Bake the biscuits until a light-golden colour (about 10 minutes). Remove them from oven and while still hot use the end of a round-handled wooden spoon to make an indent in the top of the biscuit. After the biscuits are cooled, carefully remove from pan. If desired, dust with icing sugar. 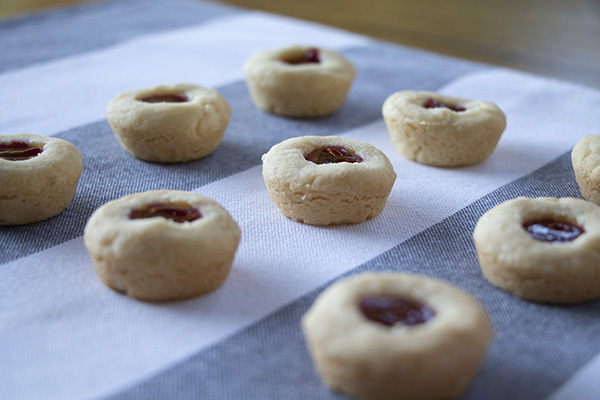 Warm jam in saucepan, put into small plastic bag, snip a corner and pipe into indentations.